According to leaks around the web, Fujitsu-Siemens will unveil a high-end smartphone loaded with features at 3GSM in March. 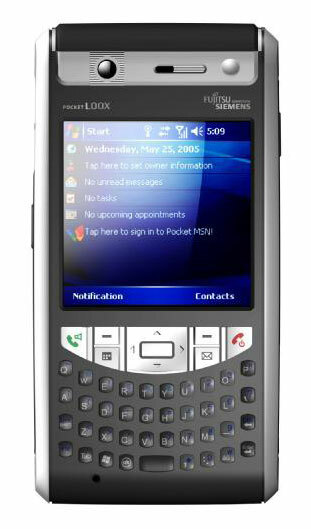 The T800 [ .jpg image ] will roll-out a QWERTY keyboard with a 240×240 display, rumored to be running Windows Mobile 5.0 Phone Edition on a 416 MHz XScale processor. Also predicted 64 MB of RAM and 128 MB of Flash ROM for storage the new unit will supposedly offer Wi-Fi (802.11b/g) and Bluetooth 2.0 as well.